High Mountain Wave Trekking offer central tibet tour 7 days (fly in fly out): Tibet Tours: Xigatse-Tsedang Tibetan tour, Tibet travel, Tibet package tours of Tibet, Tibet tour packages, Travelling in Tibet, travel and vacations in Tibet, Tour in Tibet, Culture Tours to Tibet, Tibet Culture tours, visit to Tibet, Monasteries excursion tours, Budhhist Culture tour. Welcome to Tibet -a land so rich in Culture, tradition and steeped in religion along the far flung unique landscape, also called the roof of the world. Let the age old Tibetan Myths & mysteries cast and enchanted spell that holds an every visitor in thrill and excitement. This tour offer you most of the popular sightseeing tour in Tibet including Potala Palace, Norbulinka Palace, Sera Monastery, Depung Monastery, Ganden Monastery, Gyantse, Jokhang Temple and Barkhor market, Sighatse and Tsedang. All the Old Monastery surrounding Tibet equally important. Tibet a place for the traveler to cast away any preconceptions you may have and join in the journey of discovery along the way... at least for a while. We have designed a several tours to suit of interests although we are always open to create new ideas and respect your suggestion. Day 01: Fly to Lhasa airport and transfer 100km to the hotel, drive through 1 hours to Yerlung Tsangpo and Lhasa river. Afternoon visit this is the holiest shrine in Tibet with houses of golden statues of the Shakyamuni Buddha, brought to Tibet by the Chinese princess Wenchen. Day 02: Morning visit Potala palace, the seat of both religion and politics in Tibet. It was built in the 7th century by Tibetan king Songtsen Gampo and later renovated by the 5th Dalai Lama in the 17th century. Afternoon visit Sera monastery, 5 km north of Lhasa city. 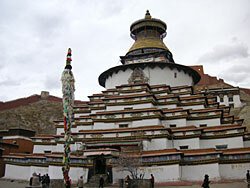 It was built in 1419 by Jamchen Choeji, a disciple of Tsongkhapa, founder of the Gelugpa sect. Sera is one of the three major monasteries of the yellow sect in Tibet. and visit Tibet Museum. Drive to Gyantse which takes 2 hrs. Gyantse is small bustling town steeped in history. It lies 260 km Southwest of Lhasa on the northern bank of Nyangchu river. In the 15th. Century is served as the Capital of a small Kingdom. Visit Kumbum Stupa & Pelchu Monastery which was built around 1400 AD It later became the main center for trade with British / India. Overnight hotel. Drivedrive takes 8 hrs you to Tsedang crossing the Karola pass (5010m) and Kampala pass (4794m). The Karola climbs between two lofty mountains, Nochen Kangsang (7223m) and Ralung (6236m) while driving you will see the Yamdrok Tso (Truquoise Lake) which takes approx. 1hr to cross around. After passing Kambala, Lhasa Valley is seen to the north. Reaching Tsedang and check in hotel. Day 06: Drive to Samye Monastery. It takes 1 hour through the Yarlung Tsangpo River via visiting Samye Valley. and afternoon visit Yumbulakhang palace, that is the earliest Buddhist Temple in Tibet. and Tradruk temple which is located 15 kilometers from the center of Tsedang. O/n Tsedang hotel.